Put your Marketing Dollar Where the Action Is! 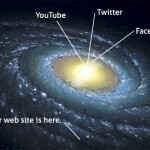 | The Humble Guru Social Networking Puts Your Ad Where the Action Is! Try to imagine the internet visually…imagine it looks almost like a slowly spinning galaxy: This vast, sprawling network of servers and routers. In the middle you see masses of giant content providers, popular web sites. You see terabytes of data streaming out from the center of this mass to the outer edges were you and countless millions of other users consume news, video and streaming radio. They are accessing shopping carts, blogs, catalogs, image galleries…everything that is taking place at this very moment. Now, take a moment and try to visualize your business within this glowing mass of infrastructure, you might imagine it sitting quietly on some server near the edge of the galaxy, much like Earth is said to be positioned within the Milky Way. So back to reality, you have created this wonderful web site explaining your innovative products. You post your content, you pay for SEO work, you even buy ads and conduct campaigns and yet so little traffic comes your way. What is the problem? The problem is you are trying to pull traffic from the busy center to your lonely little spot of the universe and unless you have something very compelling going on, nobody is interested in leaving the bright center. 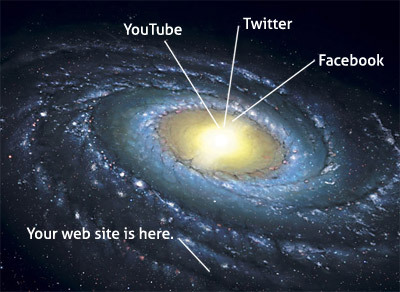 The concept I am trying to convey is that you need to regularly place your ads, your content, your products right in the middle of the traffic, in the middle of the brightest mass of the galaxy. Don’t bother trying to get traffic to your site, put your content in the middle of the traffic. That is the power of video, and especially now with the emergence of massive video sharing sites, social networks such as Facebook, Twitter and all the others out there. So, take a moment to consider what a short video advertisement might say, what it would look like. How could you make it entertaining, funny, informative? Its not that difficult. If you have ever run a radio ad, that same audio file can be re-purposed to be the audio track for you new web video campaign. So look around, find some of your previous marketing materials and see if they cant be useful in creating a new social media marketing campaign. Oh, yeah…let me know if you need my help with anything.